A state Rep. wants to bar the use of eminent domain for transmission line projects built with private funds in five northeast Missouri counties. 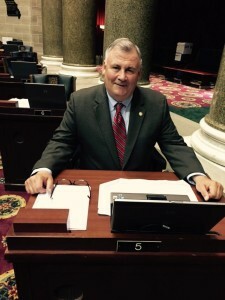 One of Kirksville Republican Nate Walker’s bills filed this session directly relates to Ameren’s proposed Mark Twain Transmission Project, which affects Adair, Knox, Marion, Shelby, and Schuyler counties. Walker says he wants to protect landowner rights that are threatened by Ameren’s proposed project. “We found through this process during the last two and a half years, that Ameren has been disingenuous with the landowners and hasn’t been approaching them in a fair and balanced way,” says Walker. The 95-mile Mark Twain line, is aimed at bolstering the capabilities of the area’s power grid. “When you talk to the landowners, you talk to the farmers that are impacted and also the farmers that aren’t impacted directly by this line, they’re very concerned that eminent domain used in an inappropriate or bad way can harm agriculture, harm their own production and hurt their land values,” says Walker. Walker is also proposing to require utilities to route easements along property, boundary, or section lines.